Background Myasthenia gravis (MG) is an autoimmune disease involving the formation of antibodies against the nicotinic acetylcholine receptors. Thymectomy is the treatment in MG patients with thymoma. We report a case of an MG patient who developed postthymectomy bilateral pneumothoraces after the placement of a subclavian central venous catheter. Case Report The 21-year-old patient with MG underwent a thymectomy and, in a later admission, complained of myasthenic crisis symptoms. He was scheduled to receive plasma exchange therapy and electromyography the following day. Plasmapheresis was initiated after the placement of a right subclavian dialysis catheter. Postinsertion chest x-ray revealed bilateral pneumothoraces after a single unilateral attempt to cannulate the right subclavian vein. A right thoracotomy tube was placed with interval resolution of the bilateral pneumothoraces. Conclusion The development of bilateral pneumothoraces in this case was attributed to the possible accidental communication between the 2 pleural spaces, which rarely happens during thymectomy surgery. Thymoma exists in 10%-15% of MG patients, and this group of patients will likely benefit from a thymectomy as it can improve their symptoms.2 Pneumothorax is a known complication of central line placement in the chest, and the incidence is reported to be higher with subclavian vein catheterization compared to other central venous lines.3 We present a case of a patient with MG who was treated with thymectomy and then developed bilateral pneumothoraces after a single attempt at placing a subclavian venous catheter. A 21-year-old Caucasian male with a medical history of seropositive MG that was first diagnosed in September 2008 was subsequently treated with thymectomy in November 2008. He presented 1 year later to the intensive care unit at the Cleveland Clinic with myasthenic crisis. The patient reported that during the prior 4 weeks, he had experienced worsening symptoms. Initially, these symptoms included dysarthria, nasal voice, difficulty swallowing, and occasional ptosis, but no double vision. Then he began to experience frequent falling that resulted in head trauma and loss of consciousness, excessive salivation, lacrimation, abdominal cramping, and vomiting. The patient stated that his legs “have been giving out.” His home medication included pyridostigmine bromide 60 mg every 4 hours and azathioprine 100 mg in the morning and 150 mg in the evening. Previous mycophenolate therapy had failed. The patient also reported that 2 weeks earlier he had had flu-like illness with fever. The critical care team was consulted because the patient was progressively deteriorating, with increasing shortness of breath and increasing oxygen requirements. His oxygen saturation was 93% on a 100% nonrebreather mask. Later, the patient was intubated and mechanically ventilated because of inadequate airway protection and respiratory muscle fatigue. He was scheduled to receive plasma exchange therapy and electromyography on the following day. Plasmapheresis was initiated after the placement of a right subclavian dialysis catheter, which was placed after a single attempt. 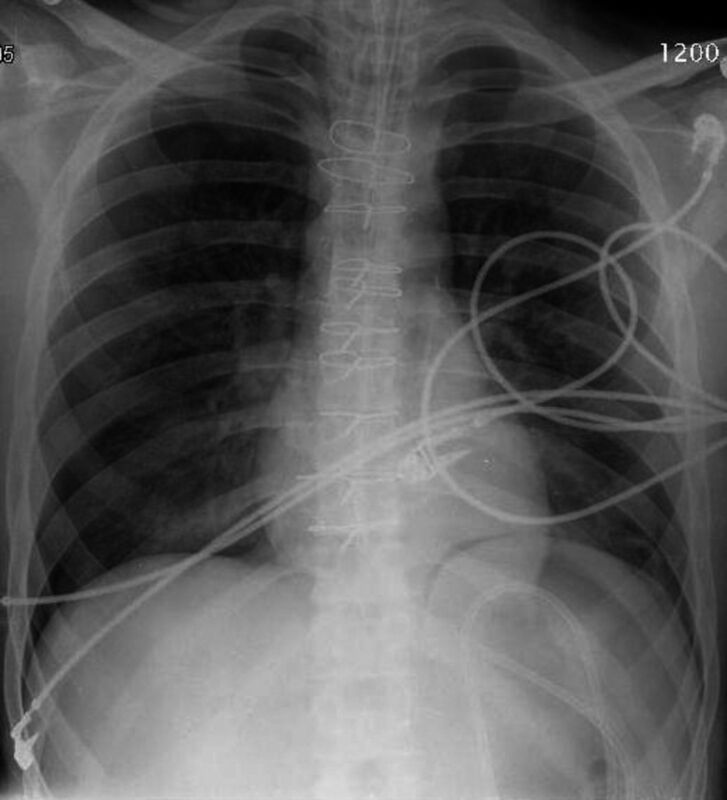 Following insertion of the subclavian catheter, a chest x-ray revealed bilateral pneumothoraces. Because we cannulated only the right side and the patient developed bilateral pneumothoraces, we hypothesized that a communication was created between the 2 pleural spaces during the previous thymectomy surgery. We placed a right thoracotomy tube with interval resolution of the bilateral pneumothoraces, confirming our hypothesis about the presence of a communication between the 2 pleural spaces. The patient underwent 6 rounds of plasmapheresis and was successfully extubated. He was then discharged with an oral steroid and appropriate follow-up. Bilateral pneumothoraces after thymectomy are very rare. We attributed the development of bilateral pneumothoraces in this patient (after a single unilateral attempt to insert a subclavian venous access on the right side) to the communication created between the 2 pleural spaces during his previous thymectomy procedure. Our patient with MG developed bilateral pneumothoraces after the placement of a subclavian venous catheter. The development of bilateral pneumothoraces in this case was attributed to the accidental development of a communication between the 2 pleural spaces during his previous thymectomy surgery. Chest x-ray showing bilateral pneumothoraces. (10, 2001) Myasthenia gravis: diagnostic and management dilemmas. Curr Opin Neurol 14(5):583–589, pmid:11562569. (2, 2008) Optimal therapy for thymoma. J Med Invest 55((1-2)):17–28, pmid:18319541. Technology Appraisal: The Clinical Effectiveness and Cost Effectiveness of Ultrasonic Locating Devices for the Placement of Central Venous Lines. September 2002, http://www.nice.nhs.uk/guidance/index.jsp?action=byID&o=11474. Accessed February 14, 2013. (12 23, 2003) Treatment of autoimmune myasthenia gravis. Neurology 61(12):1652–1661, pmid:14694025. (3, 2004) Thymectomy in the management of myasthenia gravis. Semin Neurol 24(1):49–62, pmid:15229792. (11, 1988) “Maximal” thymectomy for myasthenia gravis. Surgical anatomy and operative technique. J Thorac Cardiovasc Surg 96(5):711–716, pmid:3184965. (2005) Shields TW, LoCicero J, Ponn RB, et al, eds. General Thoracic Surgery. 6th ed, Standered thymectomy (Lippincott Williams & Wilkins; Philadelphia, PA) In, pp 2629–2633.